This is the moment a dog owner cried helplessly as she watched a PIT BULL off its leash kill her small pet. 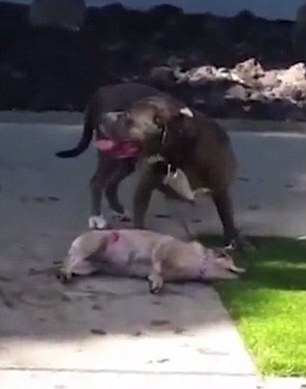 Onlookers gathered to watch in horror as a large pit bull viciously killed a small white dog in front of its owner in Los Angeles. The owner pleaded with the animal to not kill her pet but she could do nothing to stop the pit bull from biting her dog in the neck. In the video a small white dog is motionless on the ground as a grey pit bull stands over it. The dog had wounds near its rear legs and neck where the larger dog had bitten it. The owner - who is still holding the leash of her dead dog - cries as she pleads with the animal to leave her pet alone. 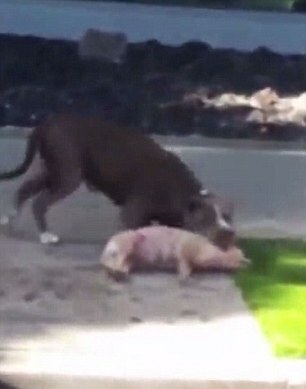 As the pit bull sinks its teeth into the still dog's neck, she starts screaming louder. The man filming the video from his car offers up a large object to another onlooker to shoo the animal away. The dog runs off after it is scared away, leaving the owner to cry over her pet's body. She says she doesn't know what to do as people try to console her. The man filming drives around and seems to find the pit bull's owner and informed him of what the dog had done. 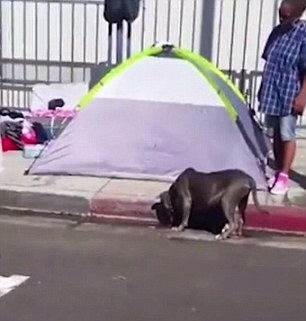 The owner - who seemed to be staying in a tent outside - questioned if it was the right dog. He had two pit bulls that were running around the area without leashes on. 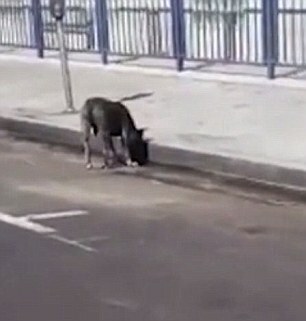 At the end of the video two officials were seen approaching the man who seemed to own the pit bulls. Heartbreaking. The pit bull looks pleased with itself in the video, it's chilling. This wasn't a fight; it was an act of predation. A dog that sees its own kind as prey, us as prey is NOT a pet. They have no place in human society. This world is crawling with pits! They might as well be lions. These "dogs" break every rule of healthy, social dog behaviors. They are bred to kill and that's what they do. it's so simple to understand! One horrific mauling is enough to convince me but it happens everyday! I think it goes on because there are evil people that love dogfighting. Just like child abuse goes on because there are pedofiles. The aspca and other fighting breed advocates push pits because they are being bought by dogfighters. It's a circle of cash and they are in eachother's pockets. This was a dog fight. Dog fighting is a felony. Somehow, our laws fail us at every level. Traumatic circumstances like this are commonplace. We are just supposed to watch our pet dogs get slaughtered. This is totally inhumane, but the humane societies of this country cannot bear the thought of humanely euthanizing pit bulls. Nope! They'd much rather save pit bulls so that the pit bulls can kill harmless, safe, loving dogs of NORMAL PEOPLE! This is totally preventable, but that means no more pit bulls. The whiny pit bull whores will not tolerate it.